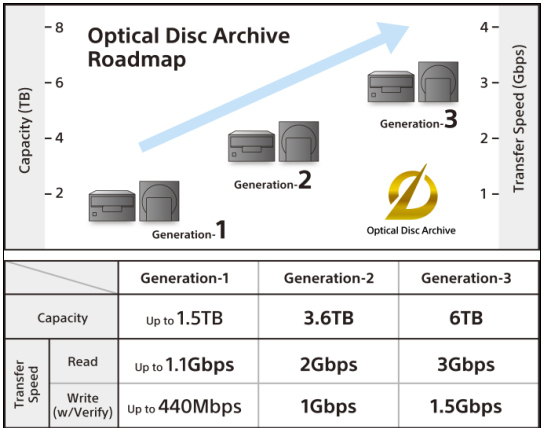 [:en]Optical libraries are practical for small to medium size archives (1TB to 200TB). Optical libraries are very power efficient with drives consuming less power than tape. Blu-ray (BD) technology offers an industry standard, backward compatible technology based on bare media. Plasmon UDO (Ultra Density Optical) and Sony ODA (Optical Disk for Archive) technology offers proprietary solutions based on media inside a protective cartridge or cassette. Blu-ray, with BD-XL media, now offers capacities of 100GB or greater. UDO2 has 30GB per side (60GB total per cartridge) and ODA offers up to 1.5TB per cartridge, with a roadmap to 6TB per cartridge. One key advantage of using optical media is its use of block addressable media. Once the media is loaded into a drive any file on that media can be accessed in milliseconds. Optical media benefits from advanced error correction should fingerprints or scratches contaminate the media. Media life is also excellent, manufacturers warranty media for 50 to 100 years. Creating offsite archives is easy and low-cost, copies can be made and exported to be stored at a second location. WORM (write once read many) media is often used in optical archives, to create a compliant and unalterable copy of data. A drawback of using optical is the relatively low capacities of each media, compared to tape or disk. In addition, typical load times are around 30 seconds (faster than tape but slower than disk). If hundreds of retrievals are made over a short period the library can quickly become unusable. As part of a 3-2-1 Archive, optical technologies can play an important role, particularly for small file sizes and small to medium sized archives. It offers excellent total cost of ownership due to low running costs and long usable life. Using QStar Archive Replicator software, optical libraries can be paired with a RAID system to create a fast and resilient archive. The removability of optical also allows a simple Disaster Recovery (DR) strategy to be created, by copying media which can then be stored offsite. [:ja]Optical libraries are practical for small to medium size archives (1TB to 200TB). Optical libraries are very power efficient with drives consuming less power than tape. Blu-ray (BD) technology offers an industry standard, backward compatible technology based on bare media. UDO (Ultra Density Optical) and ODA (Optical Disk for Archive) technology offers proprietary solutions based on media inside a protective cartridge or cassette. Blu-ray, with BD-XL media, now offers capacities of 100GB or greater. UDO2 has 30GB per side (60GB total per cartridge) and ODA offers up to 1.5TB per cartridge.